So, for some odd reason, we your humble Secret Identities editors decided to each do a rendition of the iconic Autobot leader Optimus Prime. This all started because Jerry posted a quick sketch of Prime that Parry did and shared it with all of his Facebook friends. “I was looking over some of the sdcc photos that Marcy took of the iron fist you tattoed on my arm and noticed she called him a ‘transformer’ because you were originally supposed to draw an optimus prime for me. 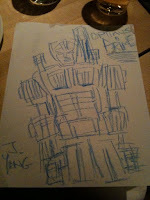 Then I remembered you sketching him out on a napkin at Nobu and being amazed at you recalling all his little details. So I too, starting sketching him out to see if I could rememeber as well (see attached) and [Parry’s daughter] Avery came up and asked if I was drawing a robot – to which I proudly replied ‘Yes, it is!’. Avery: Are you practicing so you can draw me a robot someday? Avery: I’ve never seen you draw a robot before But Jerry could probably draw me a better one. Seeing that Parry had left out Prime’s trademark horns, I started sketching out my own version and sent it to Jerry and Parry. Thus, challenging the rest of the crew to a draw-off. If you look closely, you can see that I sketched this on the back of another document. (I didn’t have any blank paper on hand). 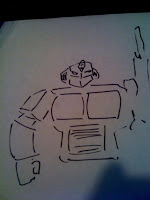 I did this from memory, but needed help on the Autobot symbol. That thing is hard to draw! Up next in the Optimus Gauntlet was our Editor-In-Chief himself, Jeff! I think this is the first time I’d ever seen any of Jeff’s doodling. (I’ve seen Parry sketch a few times. He even did our contribution to the “signing wall” at the Chicago comic shop Challenger’s!). Jeff did his sketch freehand and in crayon. He claims his five-year-old son Hudson loves it though. 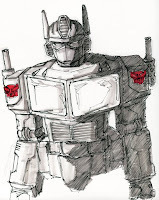 Even if he did draw Optimus with lips (just like the Michael Bay movie). Personally, I think the blue crayon is a nice touch! Up next, artists Bernard Chang and Jef Castro throw down the gauntlet as they transform and roll out their own five-minute Primes. 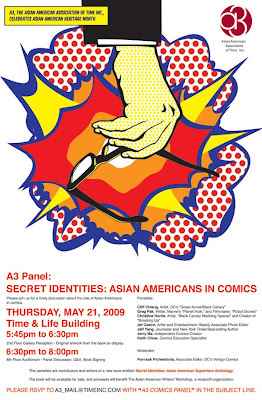 “Peril” can be found on page 183 of “Secret Identities: The Asian American Superhero Anthology” which is now available in bookstores and comic shops everywhere. This is the eighth and final motion comic preview. In the story By the Time I Get to Arizona, a young man named Mason Wong learns that his father has been incarcerated and accused of spying on the United States. His father, Dr. Benjamin Wong, was a research scientist that helped develop a series of nanotechnology prototypes that gave people superhuman abilities. Mason is sent on a quest by his fathers partner, Dr. Malcolm Eady, to retrieve a weapon before it gets into the wrong hands. Peril was partially inspired by the real life case against Dr. Wen Ho Lee. In 1999, Lee, a Chinese American scientist who worked at Los Alamos National Laboratory was indicted on 59 counts of espionage, jailed in solitary confinement for several months, and released on time served after the government failed to prove its case against him. He was ultimately charged with one count of mishandling sensitive documents, while the other 58 counts were dropped. In the months leading up to Lees indictment and release, several media organizations, and top federal officials, had made Lees name public, which exacerbated perceptions that the foreign-born Lee was a threat to national security. Written by Keith Chow, with art by Jef Castro, “Peril” is one of the 52 originally conceived superheroes of the S.I.Universe. Find it on YouTube here.